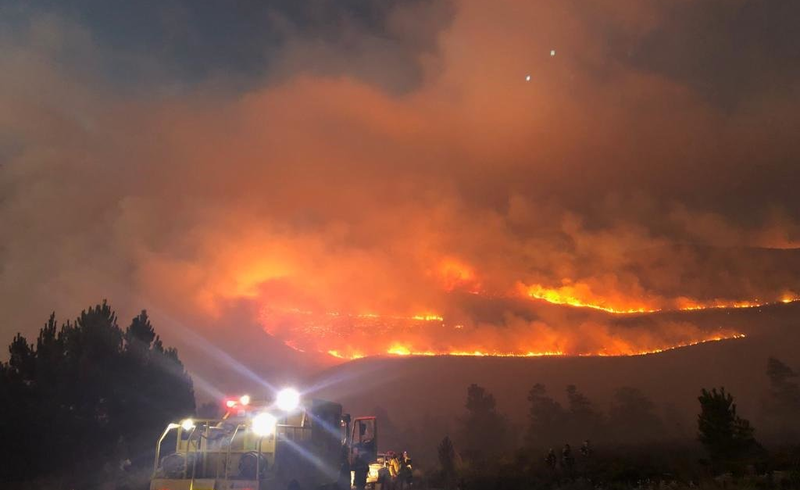 While a blaze on Cape Town’s Signal Hill has been brought under control, firefighting efforts are still continuing at the Van Der Stel Pass near Grabouw in the Western Cape, officials have said. The fire in Grabouw has been “60-80% contained”, Western Cape local government spokesperson James-Brent Styan said. “This means they aren’t fully under control, but teams will be on site the whole day,” he said. Styan said they were lucky that there wasn’t much damage to property, as the bulk of the fire was in the veld area. “It’s always tricky with the wind,” he added. The South African Weather Service predicted a maximum temperature of 35°C on Monday and a top wind speed of 28km/h. On Saturday, Capetonians took to Twitter to complain about smoke hovering over much of the City Bowl, southern suburbs and northern suburbs areas, as the winds blew smog eastwards from Grabouw. Officials on Sunday said the fire lines on the pass were much better, but tricky weather conditions were making things unpredictable. City of Cape Town Fire and Rescue spokesperson Theo Layne said firefighting crews would remain in the Signal Hill area all day on Monday to deal with “hotspots” and to ensure that no flare-ups occur. News24 reported on Monday that the fire, which had spread along the slopes of Signal Hill and Lion’s Head on Sunday, was now largely under control. “There are two helicopters still water bombing the Glen side of Lion’s Head. There were no injuries of any firefighters, however, a person who appears to have been sleeping on the mountain sustained 45% burns,” Cape Town mayoral committee member for safety and security JP Smith said. News24 had earlier reported that officials were still evaluating the area on the lower slopes of Lion’s Head near Quarry Hill, where some had evacuated their homes.